If you’re in the market for a new RV or camper trailer, you probably already have a list of amenities that you want, need, and can’t live without. With the popularity of buying a camper on the rise, it’s not surprising to find out that even the smallest size campers are finding a way to include all the amenities on your list. Buying an RV or camper trailer means you like nature, but you also like the separation, so why should going to the bathroom be any different? Thankfully, you can have a small camper AND a bathroom, and we’ve compiled a list of the top small campers with bathrooms for you to choose from. 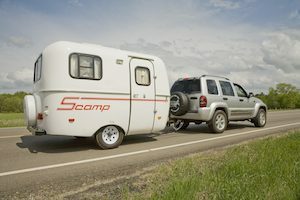 First of all, a “small” camper doesn’t have a standard definition, but for our article, a small camper is defined as either an RV or towable camper that is between 11 and 22 feet long. Besides merely being easy and fun to travel with, there are numerous other advantages to traveling with a small camper. Here are some of the benefits of Small Campers. The point of having an RV is to travel with it and then eventually park it. Whether it be in storage at home, in a parking lot or a campsite, sooner or later, you’ll have to find the space for your camper to fit. And with a smaller rig that is definitely easier to manage. It’s not the most fun part of planning a trip with your RV, but you can definitely avoid some headaches in the future by having a camper that is easy to park. Along the same lines as parking, having a shorter camper is usually much more comfortable to drive and maneuver down those dirt roads you’re craving to travel down. There are campgrounds or primitive camping sites that only certain vehicles can get to safely and with a shorter camper, you’d have a better chance to camp in this sites to get that solitude you may be looking for. Physics tells us that having a smaller camper leads to less weight and more aerodynamic, therefore allowing more comfortable travel. Not only that, but they tend to be better on gas mileage, allowing you to stay on the road longer to get to those campgrounds! As we stated before, RVs and campers have come a long way over the years, and no matter what size you choose, you don’t always have to compromise on the things you want most on your travels. Now that you’re thoroughly convinced to get a small camper, now it’s time to talk about bathroom options. First off, there are two types of bathrooms available inside campers, and they are either a full bathroom or a wet bathroom. A full bathroom has separate toilets, sink, and shower; they most resemble the traditional bathroom layout. A wet bathroom also has a toilet, sink, and shower, but they are combined so that when you take a shower, you can use the toilet as a shower bench. Besides fully portable toilets and outdoor showers, these are the two bathroom types you’ll find in the descriptions of the best small campers with bathrooms below. The Casita Spirit Deluxe Model is a lightweight travel trailer that is great for family travel. It features two sleeping areas that convert into dinette tables which can seat 6 people comfortably. The side dinette is positioned in front of a large window for enjoying gorgeous views while eating a meal. The Airstream Basecamp is a small but tough travel trailer. It’s small enough to be hauled by an SUV, but it can also handle going off-road. There is an additional Basecamp X package offroad package which features larger tires and a lift kit for higher ground clearance. This trailer is extremely well built as you would expect from Airstream. Large rear hatch door with the convertible table area creates plenty of space for your gear. The Airstream Sport is a smart, efficient design which can sleep up to 4 people. The kitchen space has every appliance you would expect in a larger trailer yet it’s light enough to be pulled by an SUV. The Scamp 13′ Deluxe is smart and efficient, and it’s great for couples or small families. The front sofa can become bunk beds, and the rear dining area converts to a double bed so it can sleep up to four people. The interior is upholstered in brown, with brown or blue cushions, brown carpet, and beige curtains. Fiberglass cabinets and wood panel doors complete the interior. The Lance 1575 is very impressive. It has a dinette “Super Slide,” and it really makes this small trailer feel larger. And, it still weighs under 3,000 lbs! It also has skylights in the bath and living areas as well as large windows. The decor fit and finish is very well done. 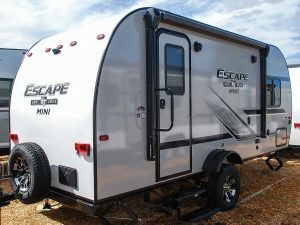 The very affordable Escape Mini is super lightweight and features a smooth fiberglass exterior, outdoor shower, and an optional Off-Road Package with extra ground clearance and 15-inch mud tires. 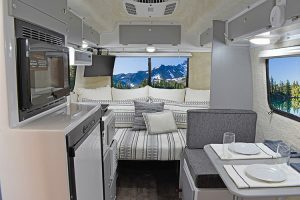 The standard interior features include queen beds, roomy slideouts, 78-inch-high interior walls, full bath, digital media stereo with dual USB ports, and an LED-lit power awning. 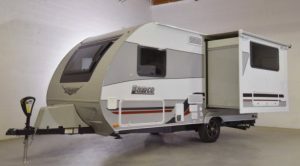 The ultra-light Jayco Hummingbird comes in 5 different floor plans. It has a compact design that is efficient and versatile. And, it comes with a 2-year warranty! 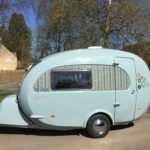 The Barefoot Trailer is an ultralight trailer made in the UK. All the edges are rounded, and it has a really sleek design. The interior features a kitchen, bathroom, sofas (converting to 6ft x 6ft bed), wardrobes and storage, hot water, heating, USB and sockets, and much more. We thought it would be cool to showcase a design from our friends in the UK. These are only 8 of the best small campers out there that provide some sort of either full or wet bath. They are all functional and even comfortable, so you don’t have to worry about running out into the surrounding nature to “do your business.” These trailers prove that you can live comfortably in a small camper trailer without compromising on amenities. So if you’re planning on going camping in a new RV, and you want comfort, look no further than this list of trailers to make a great choice! Do you have a favorite small travel trailer? Please share your comments below! To see all of our blog articles, please visit the Blog Archive! Prolite is a Canadian manufacturer of ultralight trailers since 2000. From what I can see on the web it looks like a nice light trailer that almost any car could tow. I’ve never seen one in person but this trailer offers a wet bath and seems like it is worth checking out too. Trailmanor! We love ours. Hard sided pop up type trailer. 2900lbs Low profile makes for easier more fuel efficient towing. I have a 2019 TAB 400 (16 ft) about 2800 lbs sleeps 3, AC, Microwave, wet bath, lots of large windows, exquisite light coloured Birch wood work. Permanent queen bed on back with dinner in front, 2 burner propane stove, fridge and sink. Magic fan, electric brakes, 200watts solar, 2propane tanks. Rear view camera, closet and outside excessable iunder bed storage.